To be launched at Belles Montres 2012 between November 23, 24 and 25, the stunning Oculus V.01 Argentique (Argentique actually refers to silver emulsions used by photographic films, as opposed to digital photography. ) The watch, limited to just 36 pieces, is a tribute to the world of photography, which is the inspiration for its authentic looking circular aperture. This mechanism is integrated in the rotating bezel, transforming the watch by turning the bezel at 90°, from a chronograph to a two hands watch, from sporty to instantly elegant. A timepiece with a dual personality, the Oculus V.01 is made from a titanium grade 5 case with a black DLC coating, finely sanded and with polished chamfers. A beautiful black and white contrast is also offered by the dial, where the fine honeycomb grid extends across the brightly polished steel base. Inspired by the night, the hypnotic power of the Valbray Oculus V.01 - Hypnosis is revealed via a simple rotation of the bezel which allows the disappearance of the blades and the unveiling of a dial built on a phosphorescent base. 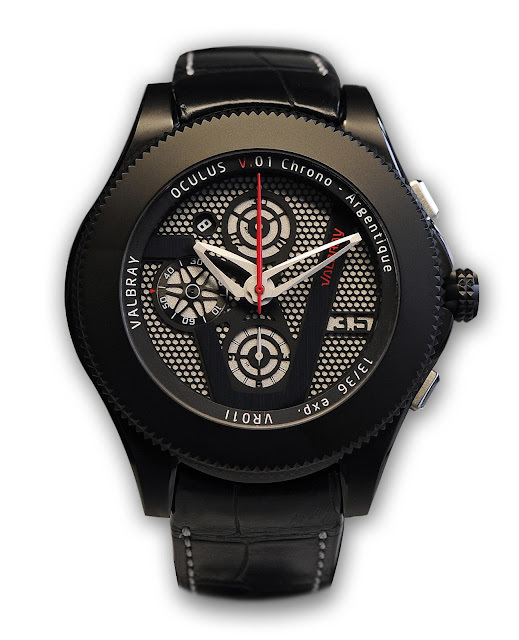 To be unveiled during Belles montres 2012 and limited to just 100 pieces, the Oculus V.01 Hypnosis is realised in titanium grade 5 with a black DLC coating, finely sanded and with polished chamfers. 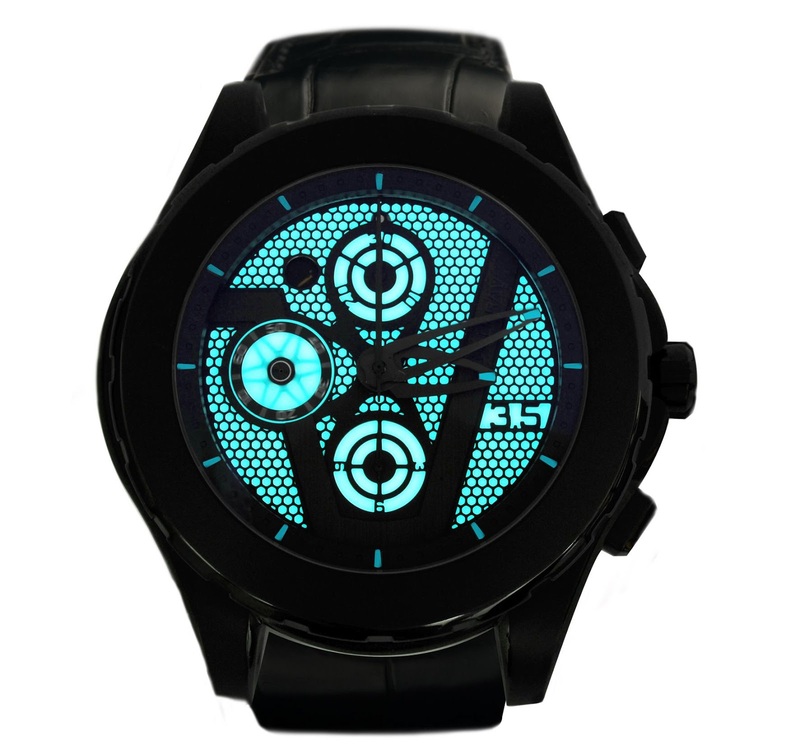 This timepiece is characterised by two surprising dials. Shutter open = sporty, Shutter closed = traditional. Its appearance changes through its phosphorescent blue pigments (Super-Luminova), to be sober by day, yet flamboyant by night. At twilight, the hands of the hours and minutes, as well as the hours index on the flange and the base of the dial transform into an hypnotic glow. Equipped with a meticulously finished Valjoux movement, visible through the case back sapphire crystal window, the watch comes on a black alligator strap with blue/grey seams. A relatively new brand launched in 2009, the Valbray concept is simple; their watches are designed to to hide and reveal, to combine elegance with sensuality, and to be sporty and at the same time ground-breakingly technical. 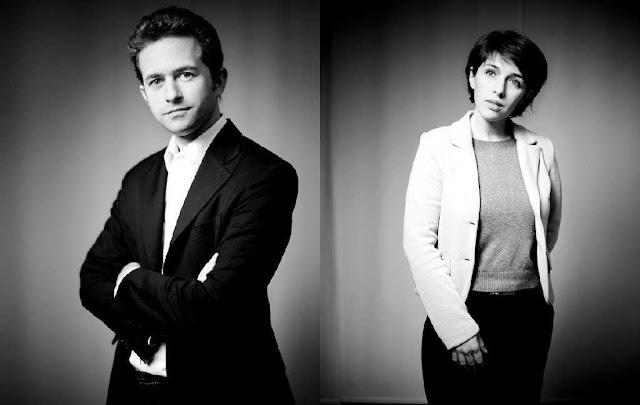 The creative duo behind Valbray is Côme de Valbray, a micro engineering major (Swiss Federal Institute of Technology). At the age of 26 he moved to the USA to attend Harvard University in order to develop his entrepreneurial skills. At the age of 28 he met Olga Corsini in Paris and two years later at the age of 30 he created Valbray with her. Olga Corsini graduated from the European Design Institute with a major in Jewellery.She worked in the creative studio of Bulgari in Rome. At the age of 26 she started to work with Gucci in Florence (Italy). More than one year later she moved to Paris to work in the Timepiece divison of Chaumet (LVMH Group). She met Côme de Valbray at the age 28 and one year later they joined forces to create Valbray Watches.